Testing your soil is the smart wat to grow beautiful vegetables, flowers, fruits, lawns and houseplants. Only by knowing the nutrient levels in your soil can you determine what you need to add to maximize growth. 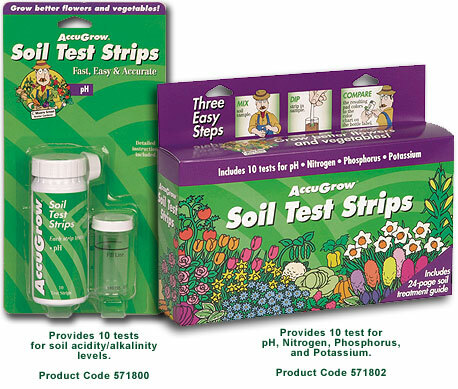 Accugrow Soil Test Strips offer a fast, easy and accurate method to test your soil. With one easy dip into the soil sample, you'll get results in minutes -- no waiting for soil to settle or dry, no capsules or powders to dissolve. pH pH measures soil acidity or alkalinity. Your soil's pH leve determines how well plants are able to draw nutrients they need from the soil. Because soil pH levels tend to change over time, it's important to test it regularly. Nitrogen Nitrogen in your soil affects the part of the plant above the ground, especially the green, leafy sections. Correct Nitrogen levels promote healthy, green foliage and lawns. Soil Nitrogen is easily washed away by rain. For this reason, you sould test for Nitrogen regularly. Phosphorus Phosphorus promotes strong root formation and root system development. Phosphorus also contributes to quicker flower and fruit production by helping protect the plant against disease and poor weather conditions. Potassium Seed formation and germination in flowers, fruits and vegetables depend on Potassium. Proper Potassium levels in your soil will produce better-tasting fruits and vegetables. Monitor regularly by making AccuGrow Soil Test Strips a regular part of your gardening activities.